You remember the hell pit, don’t you? That giant abandoned hole punched in the Chicago landscape? Here’s a plan to make that hole a lot less holey. The 110-foot wide, 76-foot deep hole was dug with the best intentions. It was supposed to house the tallest tower in the Western Hemisphere, Santiago Calatrava’s Chicago Spire. But the development succumbed to the recession and the void never got filled. It just sat there, mouth agape. For almost 10 years. There were some great ideas for what to do with the hell pit, like turn it into the world’s deepest/scariest swimming pool, but eventually the city just planted more trees around it and tried to forget it ever happened. Until now! The architecture firm Gensler has proposed a brand-new take on the Chicago Spire. No, it’s not really a spire, it’s more like an ironing board propped up over the city. 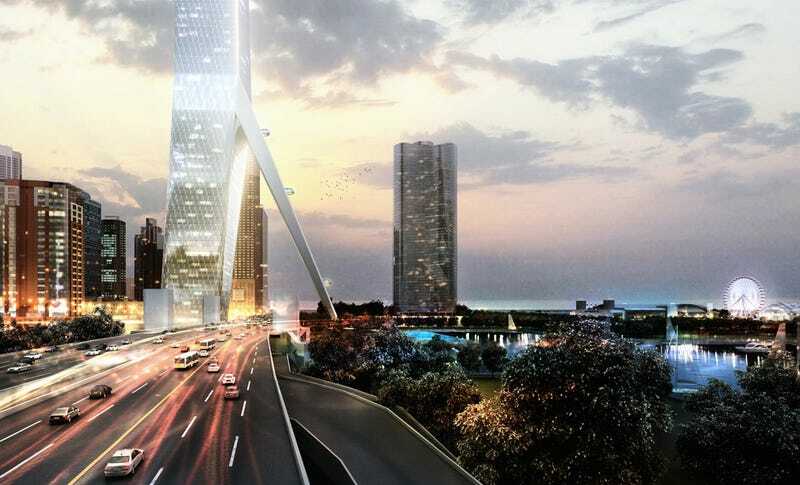 But those straddling limbs of the Gateway Tower, as Gensler calls it, would also serve as a tourist attraction, connecting to the city’s existing Riverwalk and shuttling people directly up to a sky deck that’s 2,000 feet in the air. And as Gensler explains to Jay Koziarz at Curbed Chicago, this kind of tower serves the public better than the luxury condos planned for the hole, and it generates money for the city (and yes, it has to be that tall or else people won’t go up in it). As for the role of the hole, it’s not entirely clear. Perhaps the architects need all that depth to bear the weight of the entire 2,000 foot building. Maybe visitors who board the special elevators to the sky deck will be plunged deep into the hole first before they’re then rocketed up the supertall, like an architectural drop zone ride. One thing is for certain. Anything is better than a hell pit.